birthday card my sister-in-law sent me. light stamping on the reverse side. out of one piece of cardstock instead of the customary two! cardstock that make the cards even more fun! the border is so pretty that paper, neat that you can get 3 cards out of one paper, I love making envelopes from my designer paper! What a gorgeous card/tag! 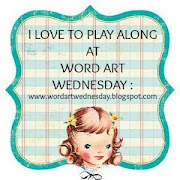 We are so blessed you joined us at Word Art Wednesday. A new Challenge just started today and will be glad to have you linked with us again. Leaving you an encouragement from God's Word found in Isaiah 12:2 which tells us, "Behold, God is my salvation,I will trust and not be afraid; For the Lord God is my strength and song, And He has become my salvation." Have a great week.